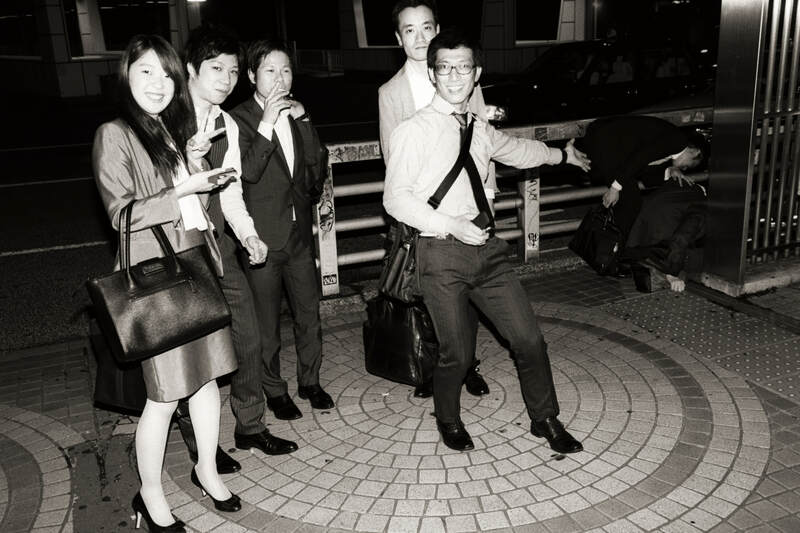 Photographically, Tokyo is a playground for me. Still going through the frames, the first edit for the slideshow I submitted to Fotoisntanbul tells a little story. Still working on / reworking that edit, so I can’t share it yet. For now, let’s just have a look at some images that are connected by their type to give you a little overview of what I tried to do in this amazing city. I also learned some painful lessons in how to use analog material – let’s have a look. First, let’s see how my Leica M6 flash street photography experiment turned out. After having shot over 7000 digital images in the first week, I decelarate a little by using an analog rangefinder almost exclusively for some days. Rewinding the roll of Tri-X that I contains the 36 most important images I shot during my whole stay in Tokyo, I am shocked: no resistance in the rewind lever. Which means: the camera did not advance the film properly – and I lost all these precious moments. The little camera got a little long in the tooth, and it’s mechanism snapped back, locking the advancing film, resulting in a ‘snap!’. All right, potentially these 36 frames are only the most important ones since I’ll never see them. I still researched how to laod a Leica with quick load mechanism properly. Turns out it’s pretty straight forward: put the film in, close the camera, advance some times. Do not fiddle around with the open camera, just trust this piece of technology from the times when the term German Engineering still stood for something. Then relax and continue with Leica M6 flash street photography ;-). I have a wekness for dark shadows & warm light. Using the analog rangefinder, I forced myself focussing on moments a little. Besides this worst case, the second worst case happens too: after having rewound half a dozen rolls of Tri-X, I am pretty fast turning the M6’s rewind lever. The little camera got a little long in the tooth, and it’s mechanism snapped back, locking the advancing film, resulting in a ‘snap!’. Which is the cruel sound of ripping film. I wonder: is that one amazing situation in Shinjuku on the part of the roll that got turned in the can already, or on that part that just got exposed to bright light while opening the camera. Turns out, the mentioned photo was on the safe part of the film – phew :-). Playing around with flash for the digital camera I have with me, capturing some clichée shots of long exposure city lights rushing by and a subject captured sharp by the flash, I thought: just give analog flashing a try. Lessons learned doing some Leica M6 flash street photography: manual flashing works great, you just have to be careaful if you are very close. A lesson I did not learn in digital TTL flashing, since that magical device takes the distance into account too, I guess. 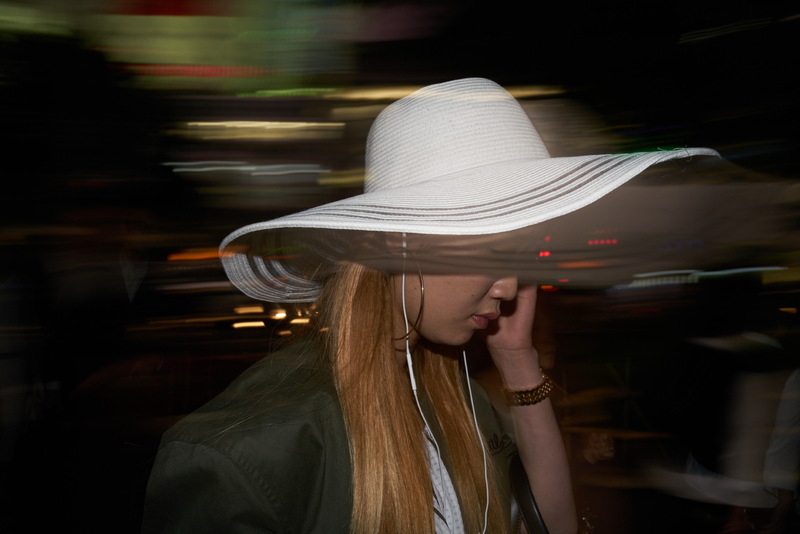 I find myself guilty of some clichées – woman with hat with second curtain flash in Shibuya for example. Another one of my guilty pleasures are scenes with deep shadows and warm highlights. Of course I do quite some of them too. Trying something new, I focus on moments – composition & light are secondary, what happens is in the main focus (pun may be intended). Ocassionally I combine this with my re-born love for flash street photography. These nice two ladies find me amusing and we have a little chat without speaking each others language. It might have been about that strange european guy taking pictures with flash. The great thing about moments is that you are not dependent on the light so much any more. I still search for a recipe for maximizing moments to catch. Right now my appriach is just to go for a stroll, follow my gut feeling and at times I get rewarded by something interesting happening. For example, a stoic Japanese guard – most of the guards I saw hardly showed any gestic or mimic at all – getting excited about something that makes him react. If you wonder what is happening here – I don’t have a clue, and find it interesting. Can somebody translate the sign? Maybe it’s just me, but I have the feeling that also small aspects of disorder feel very chaotic in this city that seems so proper and organized. To kind of complete the circle of experiments I conclude in this amazing metropole, here are some examples of 24mm focal length street photography. My keeper rate is even lower than regularly. Still I feel a certain fascination for mastering – or a least coping with – this rather wide lens. 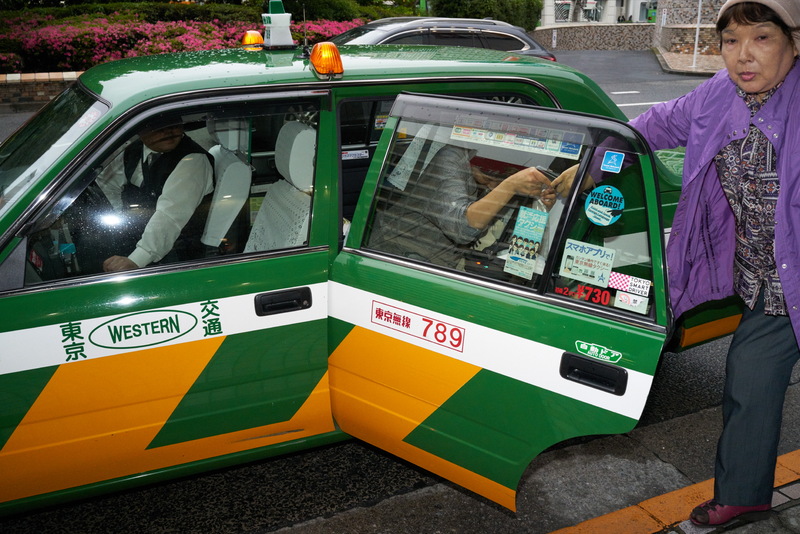 These two images are taken in Harajuku, which is an interesting area. You have a big zen like calm park on one side of the train station, and Takeshita street which is crawling with cos players and fancy dress up stores right on the other side. There also is a lovely area which is kind of inbetween, where you have stylish fashion stores in a small town like relaxed atmosphere. I might have enjoyed hanging out here the most. There is a little detail in this picture that I only realized editing. Can you spot it? All right, there is still plenty to tell you about Tokyo and what I learned there photogrpahically. I guess this post is long enough already, so I’ll just leave you with it – maybe there be the need for a third article on that time in Tokyo? Will I continue my Leica M6 flash street photography? Plus, I still owe you the story how my inked skin paid me dinnder and what happened on a night out in a surprisingly cozy area called Golden Gai, if you are interested in hearing it.